Final answers are never possible in post conflict societies. What is possible is to dig in to the past and to dig in to the truth. These truths when unearthed, reveal different perspectives. At the end, if we are lucky, we find common ground that produces reconciliation and harmony. 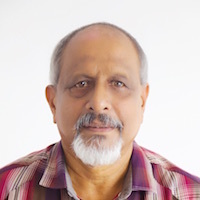 That is precisely what Social Anthropologist Sarath Amunugama did when he offered a Buddhist requiem for his teacher, fellow researcher and friend Stanley Jeyaraja Tambiah. In 1992 Stanley Jeyaraja Tambiah authored a tome ‘Buddhism betrayed?’ It was immediately banned in Sri Lanka. Overnight, he was the most reviled academic in Buddhist Sinhala society. It was not the substance of the book that created the outcry. The cover showed Venerable Maduluwawe Sobhitha thero, then in his vibrant forties gesturing with a clenched fist. It did convey the persona of the militant monk – the anti-thesis of the ascetic recluse – the orthodox perception of the Buddhist clergy. But that was neither the purpose nor the intent. Sixteen years earlier he wrote ‘World Conqueror and World Renouncer; A Study of Buddhism and Polity in Thailand. It was essentially a study of the institutions of Church and State of the Indian subcontinent and south East Asia – a primer on the functioning of Buddhist and Hindu societies. The 1992 book with its controversial cover was an earnest effort to understand and explain the behavior of a people who claim to have cherished and nurtured the essentially pacifist doctrine of Theravada Buddhism for 2500 years and more. 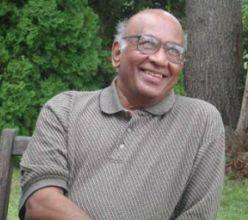 On Monday 30th November, at the ICES auditorium two of his colleagues Gananath Obeyesekere and Sarath Amunugama together with John D Rogers Historian and Director of the American Institute of Sri Lankan studies celebrated his life and work. Tissa Jayatilaka Executive Director US-Sri Lanka Fulbright Commission moderated. I attended the event not with the intention of either commenting on or reporting of its proceedings. Hence I have no notes to guide me in this missive. The delightfully erudite reminiscences of Gananath Obeyesekere was followed by an eloquently evocative tribute by Sarath Amunugama. This is not about what they said. This is about the ameliorating sense that I felt so intensely when listening to the two colleagues of Stanley Tambiah. Despite their academic aloofness they were defending a knight, unjustly wounded. ‘Buddhism betrayed? – was an interrogative title. Stanley Tambiah had deep insights in to Theravada Buddhism and its practices. His discourse was not on Buddhism. It was an effort to understand the kinetics of Sinhalese Buddhist nationalism and the role of the sangha. What Sarath Amunugama implied, I later discovered in archives. Would you believe it? A Sri Lankan newspaper editorial was captioned Buddhism betrayed. It was seven months before Stanley Tambiah passed away. Evolving Buddhist Sinhalese Nationalist ideology presented a conundrum that Stanley Tambiah attempted to unravel by the rhetorical quiz ‘Buddhism betrayed’ with a question mark. At the height of the controversy sixty one academics issued a statement in support of the beleaguered Scholar – a plea for tolerance. 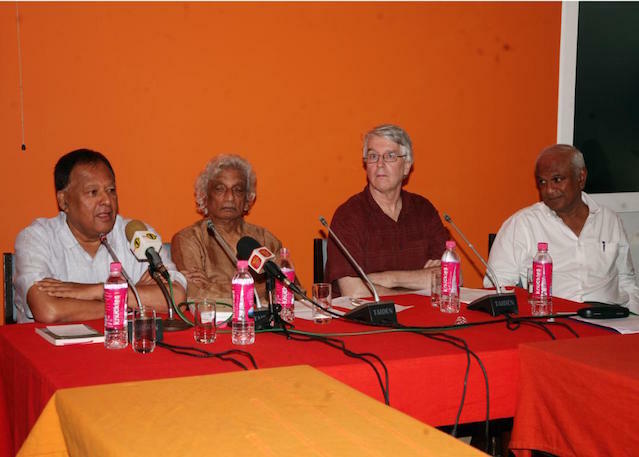 Prof. H. L. Seneviratne wrote an article “Tambiah Betrayed: Glimpses into a Forbidden Text”. Sarath Amunugama put the matter to rest at the celebration of the life and work of Stanley Tambiah with a surprisingly touching gesture of striving for the sublime. He recited four stanzas. I recall only two. Impermanent alas are formations, subject to rise and fall. Having arisen, they cease; their subsiding is bliss. Just as the water fallen on high ground flows to a lower level. Even so what is given from here accrues to the departed. Just as the full flowing rivers fill the ocean. Even so what is given from here accrues to the departed. It made a difference. It was surprising. It was not the erudite sociologist. What surfaced therein was the distilled decency of the Sinhala Kandyan Buddhist ethos – which accentuated the cosmopolitan Kandyan society from the time of its last kings. Sarath Amunugama made the point that Gananatha Obeyesekere was a hard act to follow.